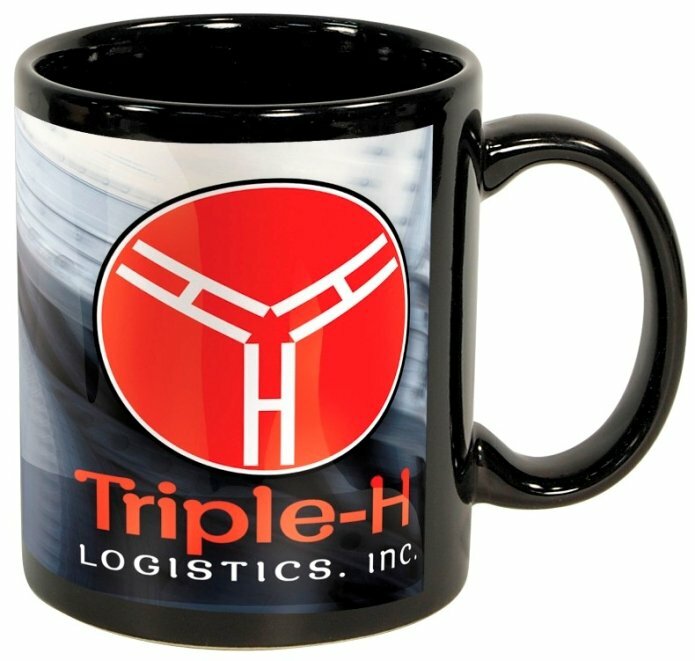 What, full color on a Black Coffee mug with your logo. Yes it is true folks. Features are quality ceramic construction with easy grip large C-handle. Overall size of this 4CP printed mug is 3 3/4 high x 3 1/4 diameter. Coffee mugs require SafePack cartons, add $6.00 per 36 units. Delivery from date of an order is three weeks. Price includes 4CP imprint on both sides in area 3" w x 3 1/2" h.
Full wrap imprint centered opposite the handle 9" w x 3 1/2" h.
Factory setup charge is only $50.00 and no extra setups. Logos do require factory ready ai, eps or pdf art files. Also jpg files at min. 300 dpi are mostly acceptable. using standard 4CP print, not guaranteed.